Put our expertise to work for you. At Waller Agencies Limited, we are committed to keeping you informed and up to date with new products. C/S re-engineered 'Acrovyn' to eliminate PVC from their entire line of products, including their wall coverings and doors! Wall protection for tomorrow's environment. To find out more, click here! Floorometry offers architects and designers hundreds of exciting visual possibilities, but Floorometry's real beauty lies in its engineering. For use in new construction and renovations. To find out more, click here! Texture, colour and enhanced shadow lines can transform the louvers from something you want to hide into a major design feature of the building. All without sacrificing performance! To find out more, click here! Representing an important evolution in sound transmission control, Modernfold's new Acousti-Seal® Encore™ operable partitions provide an industry leading acoustical performance level of 56 STC. No comparable product on the market today equals this level of resistance to sound transmission. To find out more, click here! With Acrovyn by Design, designers have unlimited visual possibilities without having to worry about damage to the graphics or the wall. To find out more, click here! When Draper committed to offering a line of revolutionary new surfaces, we started with exhaustive research. TecVision was born as we researched many competitive surfaces, explored the chemistry of screen surfaces and refined processes to manufacture screen surfaces to much stricter tolerances for unparalleled performance and quality. To find out more, click here! ​C/S Airfoil Lux keeps your building cool during the day, and looks even cooler at night. Suitable for all climates, Airfoil Lux blades and fascias utilize energy-efficient, weather-resistant LED lighting to dramatically outline or illuminate your building during evening hours. Available in 8" or 12" widths in five standard colors. To find out more, click here! ​It's the designer's choice for entrance flooring. It not only performs, it enhances your entrance and the critical first impression it makes. 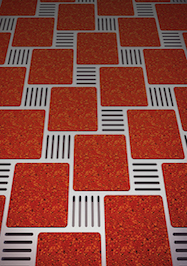 It's the new way to stop tracked-in dirt, debris and water from entering your building. To find out more, click here! There's a better way to reduce the spread of healthcare associated infections. 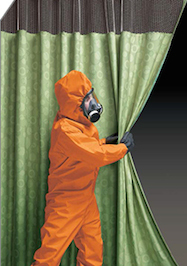 C/S Cubicle Curtains offers four easy ways to keep your facility clean and germ free. Choose from a wide variety of products including our new C/S On the Right Track hookless curtain and track system. To find out more, click here! Doors are subjected to more damage than any other building component. Acrovyn Doors are more resistant to tearing, cracking and chipping than wood veneer and HPL Doors. 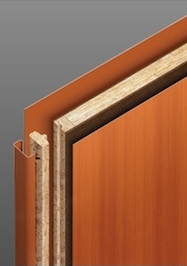 Acrovyn Doors are constructed with a particleboard or mineral core blank laminated with rugged Acrovyn sheet and field replaceable stiles and edge guards. To find out more, click here! From crowd control to waste & recycling, these distinctive pieces by some of the world's finest designers, are as beautiful as they are usable. The common theme throughout each is its ability to solve problems with style, and to apply function with flair. To find out more, click here! Discover the many innovative solutions that Talius provides for security, storm protection, shade and insect protection for our residential, commercial, and institutional clients. To find out more, click here! From gymnasium flooring and seating, to scoreboards and sport supplies - Royal Stewart Ltd has it all! 100% Canadian owned and operated, Royal Stewart has helped people bring their projects from concept to completion for over 50 years! To find out more, click here! TRI-Umph hand dryer is a state-of-the-art, ergonomic, high-speed unit. With air blowing down and back from vents on three sides, users dry their hands in 12 seconds, in a comfortable, natural position without water splash-back! To find out more, click here! Acousti-Clear®, a new innovation in space management and room design by Modernfold, Inc. delivers the ultra-sleek contemporary aesthetics of aluminum and glass with highly desired sound separation all courtesy of a new and innovative glass wall system. To find out more, click here! An unbeatable combination of looks and performance, Acrovyn Wall Panels provide the ultimate in wall protection and can be installed over nearly any wall surface. To find out more, click here! GSS raised the bar with the Elite Locker product series. Now they've built something even stronger. Introducing Excalibur! The increased steel thickness on every part of the Excalibur locker results in a product that is 25% heavier than any other locker on the market. The Excalibur Locker is the strongest and most durable locker in the market today. To find out more, click here! A marriage of European design and engineering with the American manufacturing ingenuity you have come to expect from ASI - with the shortest lead times in the industry. The Collection is made from Phenolic and offers sleek hardware, robust construction and zero sigh line doors and pilasters that meet in a flush finish with routed, overlapping closures for guaranteed privacy. And don't left Alpaco's looks fool you, the collection offers an exceptional value. To find out more, click here! Introducing ASI's EZ Fill soap dispensing system -- the only top-fill soap dispensing system that can refill up to six soap dispensers with one pour. Some manufactures talk about innovation -- ASI delivers it. Welcome to innovation -- welcome to the new ASI. To find out more, click here! SENZYO interactive flat panels encourage exchanges and improve productivity. They have all the technologies needed for instant collaboration: touch function, note taking, recording, internet, lots of connection ports, professional software and much more. To find out more, click here!